Status Report 2019: we are currently not taking on any new customers for natural swimming pools. 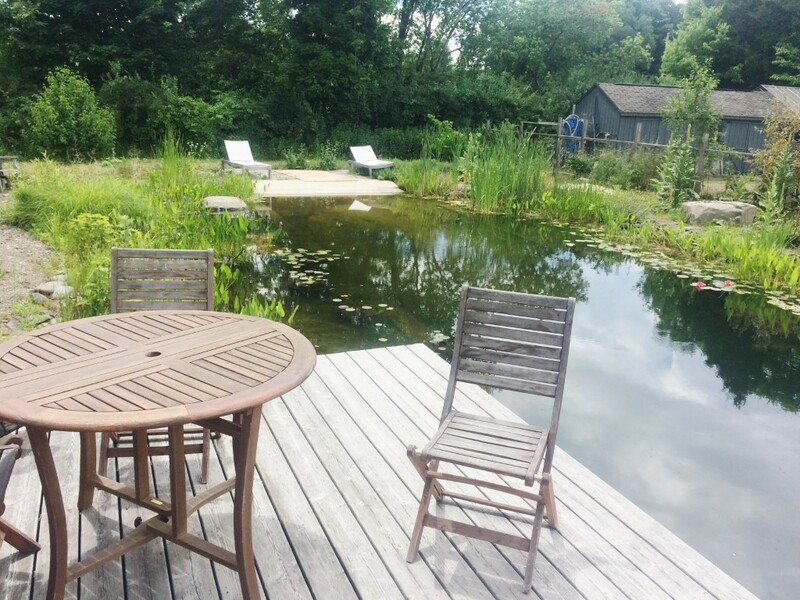 we are taking new swimming pond customers - if you are not sure if your property has the right conditions for a swim pond, get in touch and we can evaluate your property for suitability. 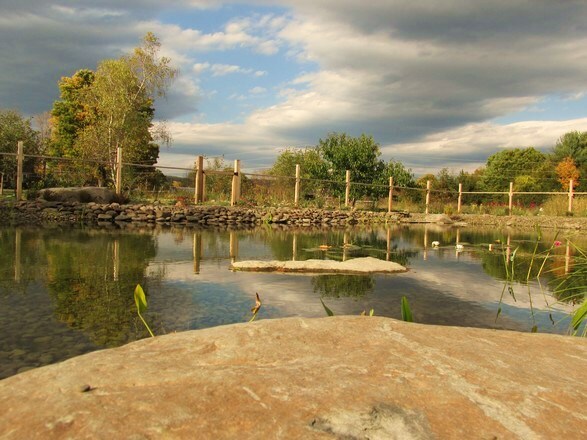 if you reside in Ulster county and would like to get on our natural pool waitlist, please send us and email with your contact information including phone number and address. 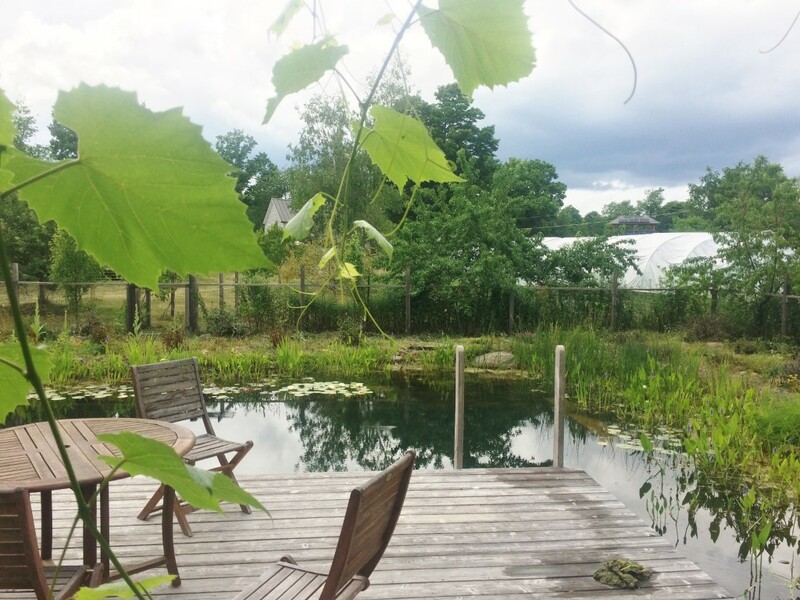 The principles and technology for natural swimming pools have been well established and tested in Europe and the UK over the past two decades. 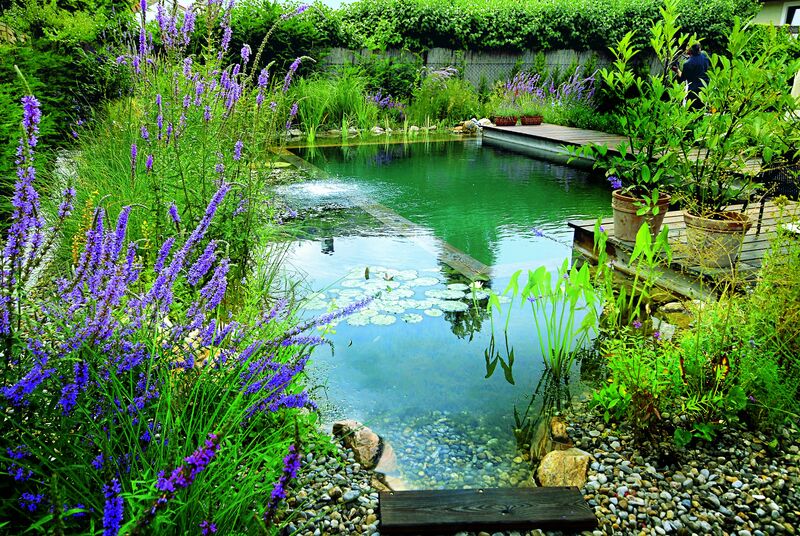 For about the same cost per square foot as a normal swimming pool (including the plant zones), a natural swimming pool features chlorine and chemical-free water which is cleaned and purified by a biological filter which also creates an attractive and natural backdrop. 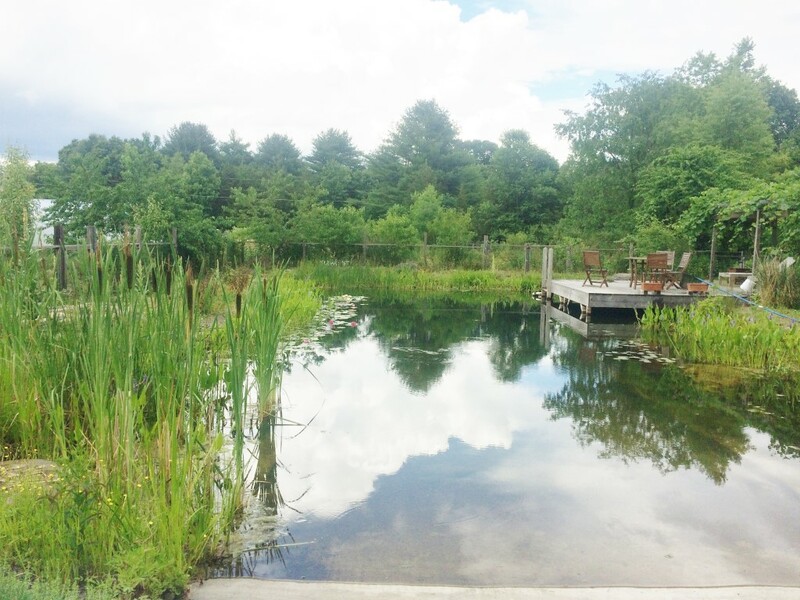 There are several technological systems for purifying water in a natural swimming pool. 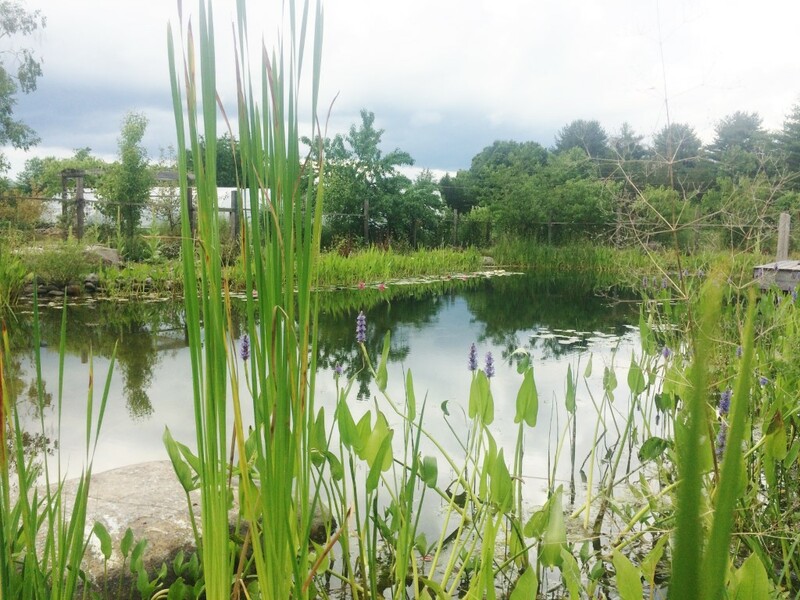 In our system, several components work together to keep the water in a natural pool clean. A skimmer system creates a gentle surface flow and removes most debris from the surface before it has a chance to sink. A sieve filter removes large debris, and the skimmed water is further cleaned by a fine particle filter after it is drawn through the pump. 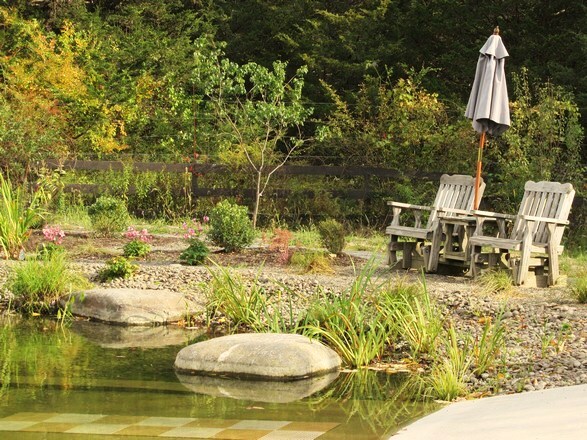 Water is then gently circulated through a layered gravel bed, on top of which plants grow. 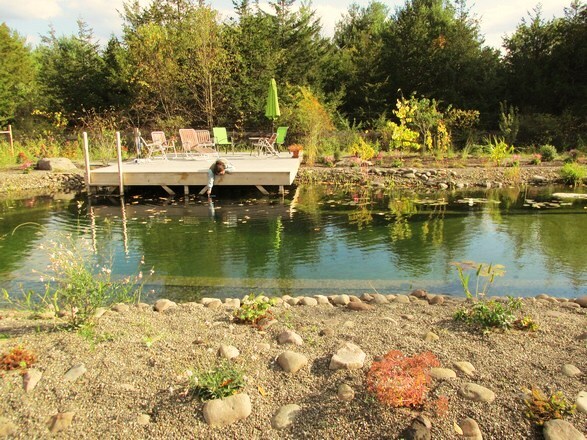 As the water filters through the gravel, nutrients are bound by a biofilm of beneficial bacteria, and transformed into a form which can be absorbed by the plants. After passing through this regeneration zone, the water crosses a barrier and returns to the swimming area which is also a part of the biological filter. In the swimming area live billions of zooplankton, which are microscope animals, invisible to the eye, which consume phytoplankton. 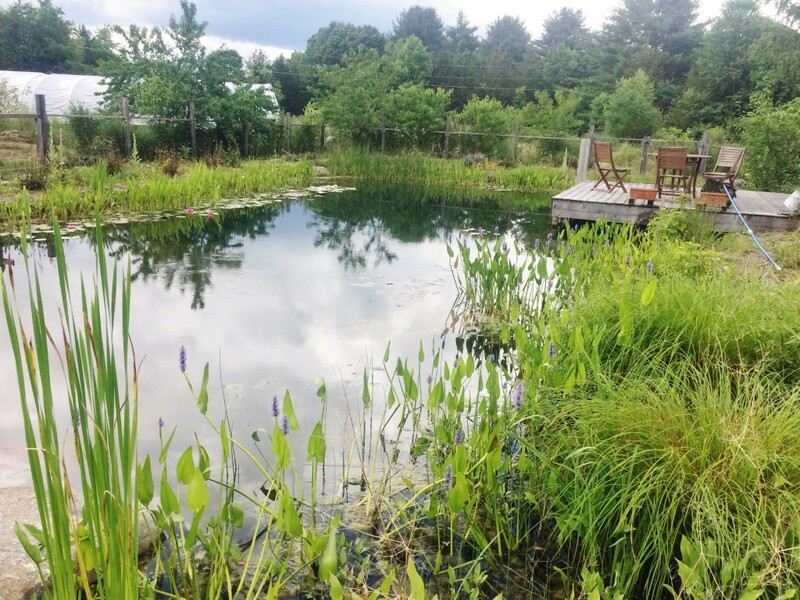 Phytoplankton, otherwise known as green and blue-green algae are the nemesis of any pool or pond owner and are responsible for the "pea soup" green water in poorly functioning ponds. These zooplankton are harmless to humans and billions of these filter feeders living in the deeper water means the water is constantly being filtered in place at a very efficient rate. Due to the importance of zooplankton, the pumping system is paired with a skimmer and run at a very low flow rate only about 25% of the time. 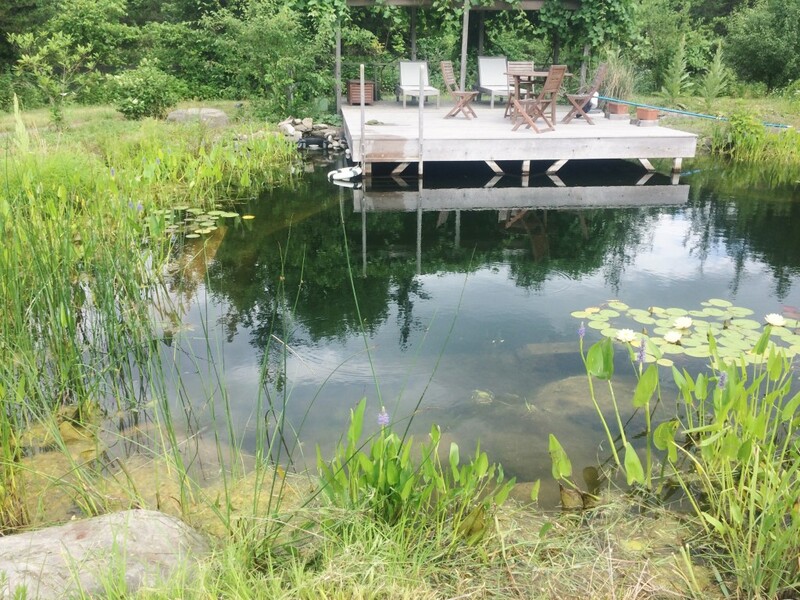 This removes surface debris while leaving the zooplankton unharmed in the deeper water and decreasing energy use considerably compared to a traditional pool or pond. Besides being harmless to humans, zooplankton are very effective in controlling and removing harmful bacteria and pathogens from the water. With thousands of natural swimming pools built and in-use in the past two decades in Europe, there have been zero reports of ill health effects. You can compare this to the increasing research on the ill-effects of chlorine on short term and long term health, and decide for yourself which type of pool is a greater health risk. While this system has been engineered to a high degree, it is still a natural ecosystem, and subject to fluctuation. In the early spring, before the bacteria, biofilms, zooplankton, and plants become established and active, the phytoplankton has a window of opportunity to thrive, and a spring "greening" of the water is possible. This is well before the waters are near being at a swimmable temperature. It doesn't take the zooplankton long to catch up, however, and as soon as water temperatures begin to rise the zooplankton population explodes and the water is quite clear by swimming season. At this point, many nutrients have been bound up in bodies of the zooplankton. As their food source disappears they begin to die and nutrients are re-released into the water, which has the potential to cause a second mid-summer bloom of phytoplankton or string algae. However, at this point the plants are in full growth and are removing nutrients from the water as fast as they are added. Having the proper size plant zone means that algae growth is limited by competition from the plants. 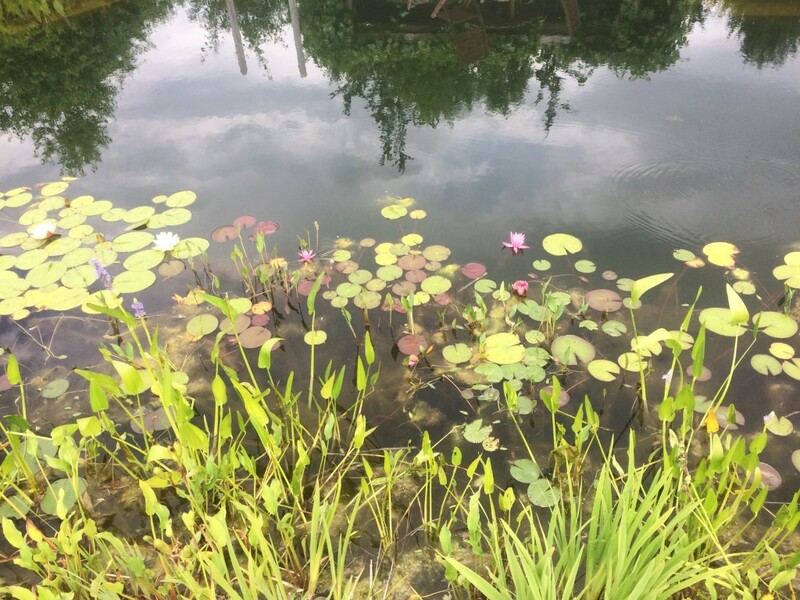 Deeper water plants are especially important in removing phosphates from the water, which is the main limiting nutrient for algal growth, and can be trimmed several times in the summer to remove phosphates from the system. As an additional control option, we offer a phosphate removal filter in the form of a fluidized bed reactor filled with special phosphate binding granules, which are replaced when they become saturated. Low phosphate minimizes algae growth. Replacing the granules annually adds cost, but in systems where the natural fluctuations described above are unacceptable, additional phosphate removal can smooth out the bumps. We do not endorse the use of UV sterilizers, salt water systems, or copper-based systems, as these essentially create sterilized water, killing off an important part of the biological filter, and in the case of salt (which produces chlorine) and copper, leaving toxic residues in the water. 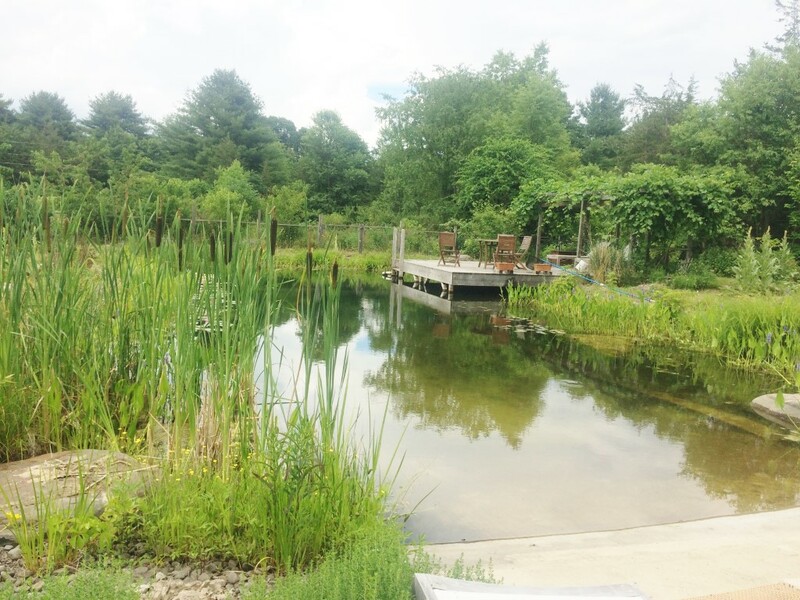 It should be noted that there are some aesthetic differences between a natural swimming pool and a chemically treated pool. Because the water is not sterilized, a brownish to greenish patina of biofilm will develop on the walls and gravel, and normally the water will maintain a very slight brownish to greenish tinge due to a small and healthy level of phytoplankton and natural tannins. Both of these conditions are part of a healthy functioning ecosystem and desirable for the role they play in keeping the system in balance. This is very similar to what you would experience from swimming in a clean lake. If you are comfortable with that then a natural pool should be comfortable for you, but if you feel more comfortable with bleached white concrete, a traditional pool may be more to your liking. Besides seasonal fluctuations, there is also a period of about 2 to 3 years required for the plant filter to become fully established and functional. 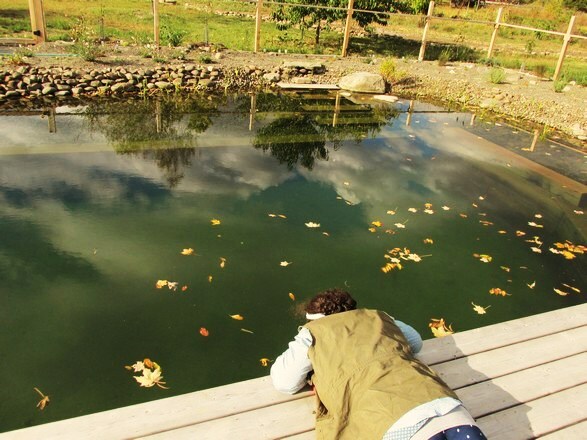 For the first year especially, the system will rely on the pump and filters more than the plants to remove nutrients and algae, which can mean nearly continuous pump operation in the middle of summer and some manual algae control. Some of the slack can also be taken up by additional annual floating-filter plants such as water hyacinth. Once plants are more established in the second and third year, pump operation can be reduced to about 25% of the time. Below are a few pictures of natural pools (not ours) from around the world for your further inspiration.